You WILL lose the weight if you change your habits, and it takes 30 days to do that. Learn 'Mind Over Fatter' and you're golden! All of the diet and weight loss failures Americans have experienced over the years can be traced down to one key fact that most people don't realize. And that fact is that it takes 30 days to change a habit. If you neglect to change your habits, any weight loss results are GUARANTEED to be short-lived. The good news is that, once you are aware of this, you simply need a strategy to allow you to actually change your habits, rather than try to "willpower" or "white-knuckle" your way down in weight. Those things will work for a little while, but even the toughest person will succumb at one point if they don't change his or her habits. And I have just the thing for you. It's a 30-Day Overhaul of the Mindset that has Sabotaged Your Fitness and Weight Loss Success. And it's called Mind Over Fatter. My name is Gina Paulhus and I'm a Certified Personal Trainer who has helped 1038 people to date lose weight AND keep it off. What makes that statement more noteworthy is the fact that virtually all of those people had tried and failed at losing weight in the past. They had tried diets and health club memberships and workout programs and have a shelf full of worthless supplements at home, but they still had every ounce of fat on their body that they started with--in some cases, even more. Each 325 pg. book is just $16.97. We decided to price the book like a regular paperback for the first printing only as a market test. This System is MUCH more powerful than a typical $16.97 book with some generic advice in it, but we needed to get the book out into people's hands FAST to build some BUZZ surrounding the book. We have 135 books left, available for this price. This book comes with coupons for personal training and fitness coaching services and a 100% MONEY-BACK No-Questions-Asked GUARANTEE. If you decide that the book ISN'T worth your $16.97, simply return it whenever it's convenient for you, and KEEP the coupons for personal training as a "Thank You" for trying to put your "Mind Over Fatter." 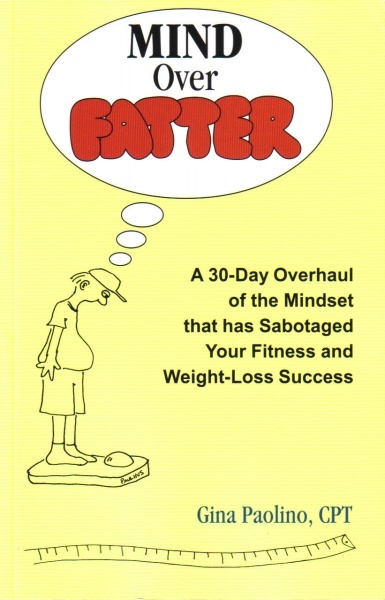 To order a copy now, pay by credit card with our secure shopping: Order Mind Over Fatter! All orders usually ship within 24 hours. You can expect to receive it three business days after placing the order. The books are going fast, and only the first 500 orders (of which 135 remain) receive the SPECIAL BONUSES. The next printing of Mind Over Fatter will include the Bonuses but the price of the System will be going up to $49.95 (My business consultant is making me charge more for this book come the second printing because it's so loaded with information). Don't miss out on this Special Low Introductory Price...you get this information-packed, photo- and bonus- inclusive 325 pg. book for just $16.97 if you're one of the first 500 people to order! Currently there are only 135 books left at this low price of $16.97. The book is covered by the Money-Back Guarantee, so in the worst-case scenario that you don't like the System, you will get ALL of your money back AND you get to keep the extra copy of the book that you gave to a friend, the special bonus sections, and the coupons for personal training! Click here to order: Mind Over Fatter, at the Special Introductory Price of $16.97, includes Special Bonus Sections and Coupons for Personal Training Services.